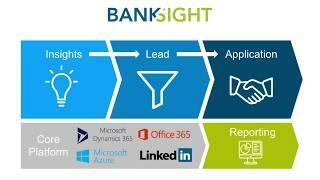 BankSight is The First Intelligent Banking CRM™ 100% purpose built for banks and credit unions. It’s powered by leading machine learning technologies and runs on the Microsoft Business Applications Platform, including Dynamics 365 and Azure with rich content from LinkedIn. BankSight enables retail bankers, business bankers, and wealth managers to deliver meaningful experiences to customers through timely, actionable, AI-driven customer insights and a single view of the customer. BankSight delivers increased NPS scores, higher cross-sell and referral ratios that increase revenues, and more loyal, committed customers with less customer attrition. With a singular focus on a stunning, intuitive User and Customer Experience and through the latest information security tools, BankSight transforms the way bankers and credit union representatives interact with their customers and members, leading to: - 2x the user adoption - 3x the deployment speed - ½ total cost of ownership BankSight's mission is to help community and regional financial institutions protect their most valuable customer relationships while improving their customers'​ financial well-being.